I am clarity, I am necessity. I am inevitability. But am I evil? If you are a series reader, and if you enjoy some YA sci-fi tossed into your reading list, then do not skip this series. It is clever, inventive, fresh, and masterfully written. I read a lot of series – some that have gone on past their Use By date – but the Illuminae Files is one that I wouldn’t mind starting over again (if I ever get to a point in my life when my TBR pile isn’t so massive. 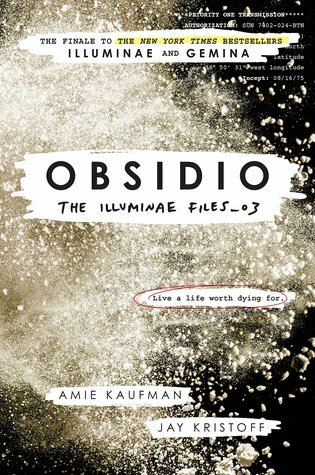 Before I launch into a glowing review of how good I think Obsidio is, Here are links to my reviews on both Illuminae and Gemina just in case you’re curious about the series and haven’t quite committed to checking it out yet. Hint: You should. Seriously. I should say first, do NOT let the size of these books scare you off. They are actually really quick reads. There are pages that read like comics. So even if your regular reading material is closer to the 200-250 page range, you’ll feel comfortable with this even though Obsidio‘s page count is 615. Trust me on that. The book is written in a series of Audio Visual transcripts and Instant Message screenshots — there are even some personal scribbled notes tossed in there too — and fascinating illustrations that put you right in the thick of the action. The layout of these books is one of the best things about the series. Any time I find myself turning a book in circles in order to read it, I know the author has me hooked and could do basically anything on those pages. And Kaufman and Kristoff do just that. Live a life worth dying for. Obsidio plays out on the page like a movie plays out on the screen. One hundred moving parts and yet all of them gel into a violent, deadly, animated, touching story of resilience and grit. Sure, it’s teenagers running around doing amazing things to save their part of the universe, but I feel sucked into their world and I don’t want to know anything other than their reality — it’s just that compelling. The two “stars” in Obsidio are girl-next-door Asha Grant and her ex-boyfriend (now turned to the dark side), BeiTech soldier Rhys Lindstrom. Both of them are in situations that they didn’t choose, but to survive they have to learn to trust each other all over again. And that’s not easy to do in the midst of a forced enemy occupation that leads to a space war right over your head. Every story needs its monster. <error> And the monster is me. One thing that kept pulling me into this serious is the presence of the mad/mad genius AI supercomputer, AIDAN. I definitely have a love/hate relationship with this thing (entity?). Is it that AIDAN has no conscience? Or is that he has more conscience than a computer should have, and therefore creates chaos? Read the books and you decide. But one thing is sure, AIDAN is the catalyst for most of the action in all three books. And if action is what you like in your reading (along with questionable moral decisions and awkward computer romance), then this is the series for you. I’m sad that it ends with Obsidio, but I feel that this book wrapped everything up nicely – no pretty bows or shiny paper here, but a solid ending that puts a bold period where the previous two books left question marks. I’m satisfied after this series, and that’s not something that I get to say a lot when reviewing other books in a series. The Illuminae Files does not disappoint.